Charming waterfront house on Atlantic side canal. Lots to see and do close by. Bring your own or rent a boat and start you boating adventure. Great protected dockage and room for your trailer. Create you own lifetime memories in this boating paradise. Send email with any questions by clicking "Ask Owner a Question" . Great for Four adults plus small kids. Wonderful protected dockage and room for trailer on the property. There is great fishing off the large dock! Lots to see and do! Tarpon, snook, snapper, redfish and more! Great views from the dock! New kitchen with all wood cabinets, granite counter tops and stainless appliances. The kitchen is fully equiped with all the essentials. We have lots of great dockage for your boat. The large docking area extends 90 feet and includes a nice cut-in slip. The dock includes electric, water. There is also a cleaning station on the dock. Also there is plenty of room for trailers on the side of the homeI. It's all about the boating. The local public boat ramp is very close and is free. The clean, furnished home features nice furniture and premium bedding, beautiful landscaping that lets you know you are in the tropics. It is a place in which to launch your many experiences that you will remember for a lifetime. Lower Matecumbe is the name of our small island in Islamorada. We are at mile marker 76.5. (THE REAL ISLAMORADA). We are walking distance to Robbie's Marina, home to a large resident population of tarpon the you can watch and feed. They also have boat rentals and tours, and a wonderful restaurant. We are also very close to Bud and Mary's Marina, World Wide Sportsman, Sandy Cove, and Calusa Cove Marinas, and more. There are many restaurants with in three miles to visit by boat or car or bike. 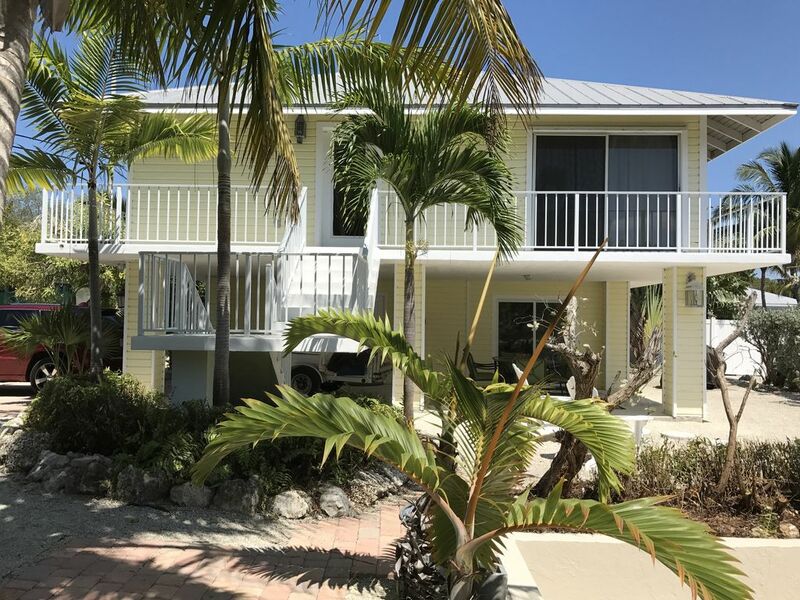 A stay at our location puts you about 100 yards from the Atlantic Ocean, but back water access takes just minutes via Indian Key Channel or world famous fishing channels number #2 or #5. Clean, quite, private, fully updated and outfitted makes our house fun and functional for the whole family. Pam and I look forward to having you stay. I will be waiting for your call or text to tell you even more about the house and the area. Feel free to send me a e mail through this web page. AVAILABLE FOR WEEKLY & MONTHLY RENTALS. INSPECTED, PERMITTED & LICENSED BY THE VILLIAGE OF ISLAMORADA # VR-113. We are a family that loves to be on and near the water. We love to fish and swim. We also love to share our favorite spots with friends and family. We enjoy sharing our home with friendly good natured families who love adventure. We are responsible owners that spend lots of time at this home. We really care about your vacation. We love Islamorada and this home. Its location helps us easily explore the crystal clear water of both the reef and back waters. We are close to many shallow water snorkeling spots and lots of waterfront restaurants. Fishing close by is wonderful. This home is located on a safe, quiet, private paved street and it has wonderful protected dockage with quick easy access. Atlantic Ocean just outside our short canal! Located in the Beautiful Village of Islamorada. Wonderful canal that leads right to great fishing and snorkeling! Ocean front canal home. Direct access to Atlantic and the reefs out our short canal. Room for the boat trailer. (3) TV in the main living area, Master Suite and guest suite downstairs. Narrow balcony wraps all the way around house. Large outdoor area great for sunning and relaxing. Anne' Beach and Sea Oats Beach are on our Island and are close by. Lots to see and explore! Close by you can swim with the dolphin or feed turtles!